Add storage and give your bedroom a welcoming, rustic allure with this sliding door chest. 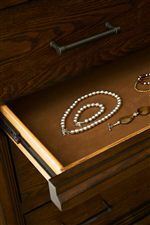 The piece offers a variety of storage options, with a hanging rod for jackets, six drawers, and a sliding door that opens to reveal two adjustable shelves and a tray drawer. 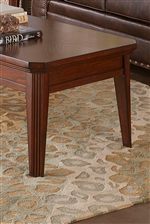 Splayed legs create a sturdy, casual base, while molding at the top enhances the stately silhouette. 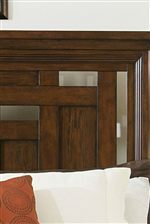 Finished in a warm Brown Oak color with an abundance of storage and a space-saving shape, this sliding door chest is the perfect piece to help you organize your bedroom. The Estes Park Sliding Door Chest with 7 Drawers by Broyhill Furniture at AHFA in the area. Product availability may vary. Contact us for the most current availability on this product.